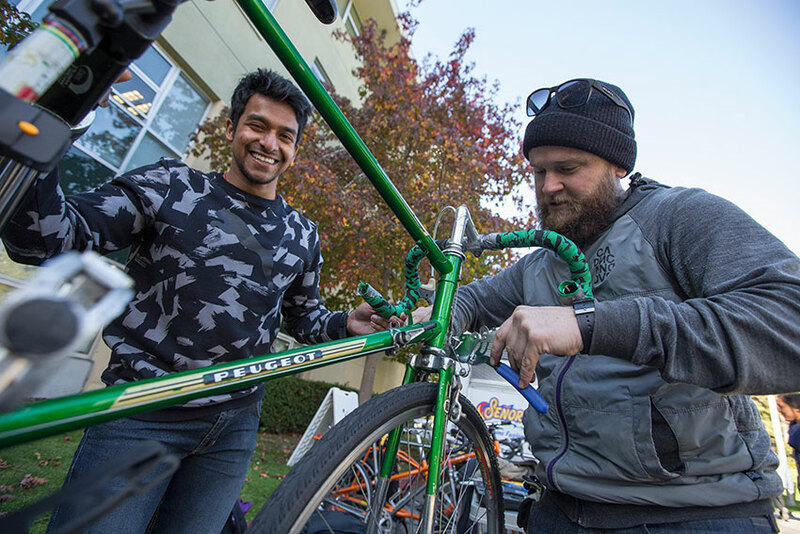 Nolen Brown (right) works on SF State student Kartik Ravi’s (left) bicycle at the farmers market at SF State on Dec. 1. San Francisco State University senior Nolen Brown has lived and breathed bicycles for the past six years. He’s a member of the SF State Triathlon and Cycling Club and uses his bike for transportation, so it was a no-brainer when he decided to promote cycling on campus as a viable commuting option. He did so by creating a do-it-yourself bike repair space inside the campus bike barn and spreading the word about safe bike storage. He also spearheaded the effort to assess and rank SF State’s bike friendliness. The nonprofit bike advocacy group League of American Bicyclists recently gave SF State bronze status as a Bike Friendly University (BFU) as part of its 2016 list of awardees. SF State is one of 51 other universities in 2016 that are leaders in creating a bike-friendly campus for students, faculty and staff. It’s the fifth year the League of American Bicyclists has been evaluating schools and so far, 164 have been listed as bike-friendly on a scale ranging from platinum to bronze. “We applaud this round of BFUs for raising the standard and being innovative in making bicycling a safe, convenient and enjoyable option for students, staff and visitors alike,” said Bill Nesper, programs director with the League of American Bicyclists. Schools are evaluated on five key areas: engineering, encouragement, education, enforcement and evaluation and planning. Nick Kordesch, a sustainability specialist with Sustainable SF State, said his office is focused on sustainable transportation. “We see biking as a part of that because it’s fun and promotes fitness and it’s a good solution to people’s commutes,” he said. Sustainable SF State has two goals: easing traffic around campus and reducing greenhouse gas emissions. “Every time we switch someone from driving to walking, BART or biking, that’s a big win,” Kordesch added. The bronze designation is basically a big checklist, Kordesch said. Some of the categories include having adequate bike parking on campus and repair facilities. The next big step for SF State is to look at more complicated adjustments, like school infrastructure and examining ways to improve bike routes around the school perimeter — something that could cause the school to jump to silver or even gold. Brown, now a student assistant with Sustainable SF State, said the direction he wants to go next is accessibility. He’d like to help create more bike-friendly routes to BART and other major bike routes in the city — something that would involve working alongside the University on its master plan. Kordesch called Brown the University’s bike ambassador. Brown runs Power to the Pedal, SF State’s bicycle outreach program that supports cycling, from holding events and repairing students' bikes to promoting biking as a healthy, sustainable and fun way to get to campus. For example, Brown has a bike repair booth at the campus farmer's market where he repairs bikes free of charge. Brown’s passion for cycling has turned into a big win for SF State and its growing bike community.